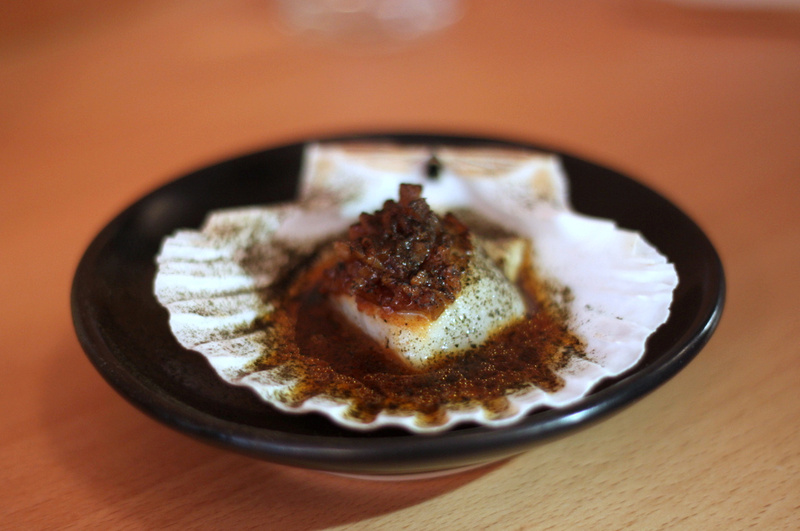 Today on the blog - two of London's street food heroes Bao & Bleecker Burger settle down in Soho and Spitalfields respectively, and One Mile End brewery brings a Whitechapel boozer back to life. Wednesday April 8th - I made my way over to Bao about 30 minutes after it opened - beat the crowds and all that; stay ahead of the game. No such luck. I joined the back of the (admittedly fast moving) queue, got me some water from Pret, and stared longingly at Clerkenwell Boy's food both through the window and on his Instagram feed. 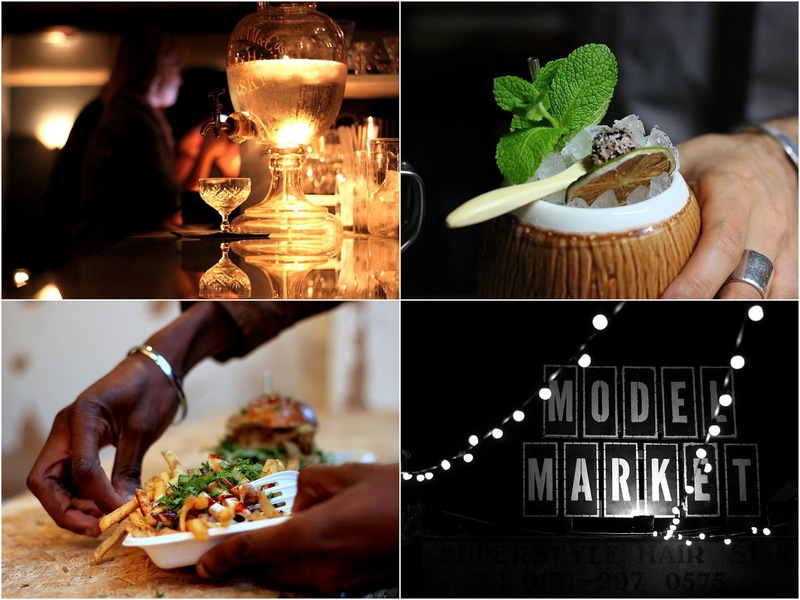 The foodie world was out in force, and Instagram was overrun by Baos and Blood Cakes for the rest of the day. One of London's finest food writers Ed Smith (Rocket & Squash) was also one of the first through the door, and he put up another of his reliably witty and informative posts the next day, rendering this irrelevant. Read up on all things Bao on Rocket & Squash here. I'll soldier on. 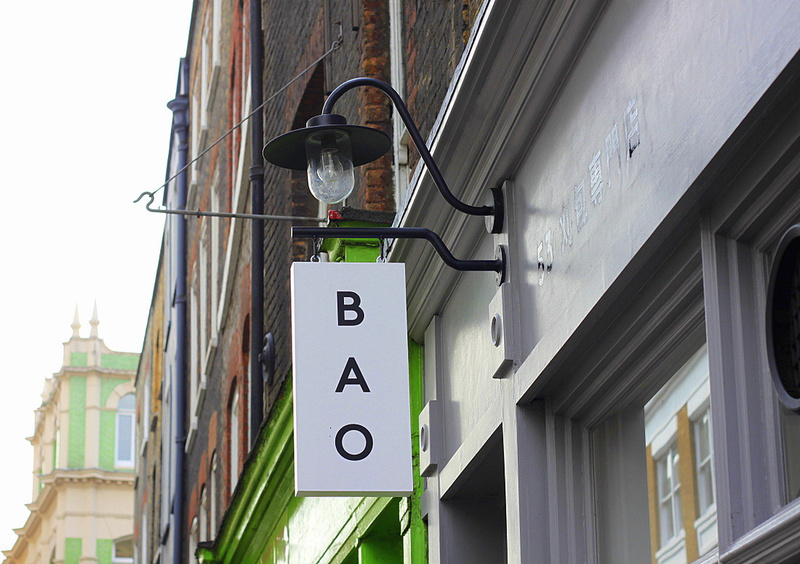 Bao built up a loyal following whilst trading at Kerb, Netil Market and the like, and their tiny Soho site is surely the first of many. 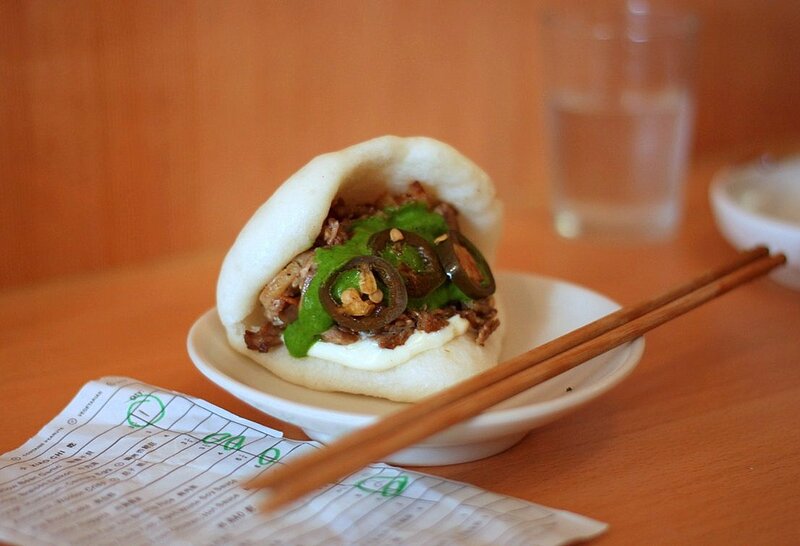 Like Yum Bun and Beer & Buns, they focus on gua bao - super squishy steamed buns of joy filled with all manner of delights. Take along a pair of googly eyes and you'll soon have something resembling Pacman stuffing his face. But that's not all. It seems they had a few Taiwanese tricks up their sleeve that they were saving for a permanent site. I'm talking Trotter Nuggets (£4), Scallops with Yellow Bean & Garlic Sauce (a little small for £3.50), and the room-dividing Century Egg with Eryngii Mushroom (£4). 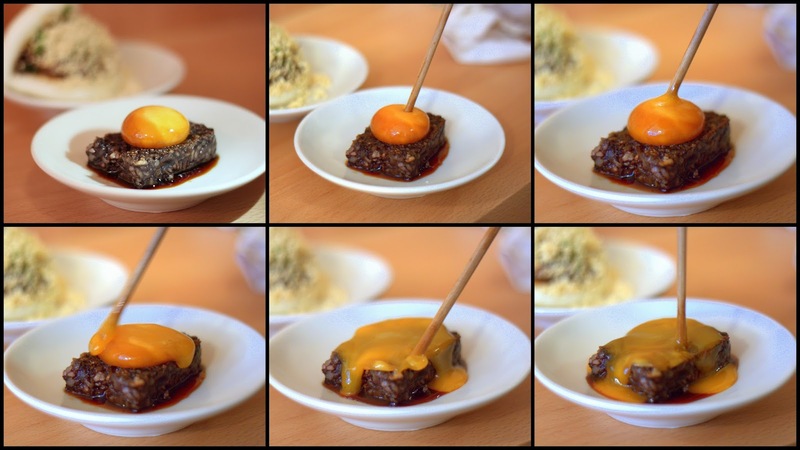 The two non-bao dishes you absolutely must get are the 40 Day Aged Rump Cap with Aged White Soy Sauce (£6) and the much-photographed Pig Blood Cake (£3.50) - see #eggporn collage below. How we managed to share these two without trading blows, I'll never know. Of course, you need to get some gua bao down you too. 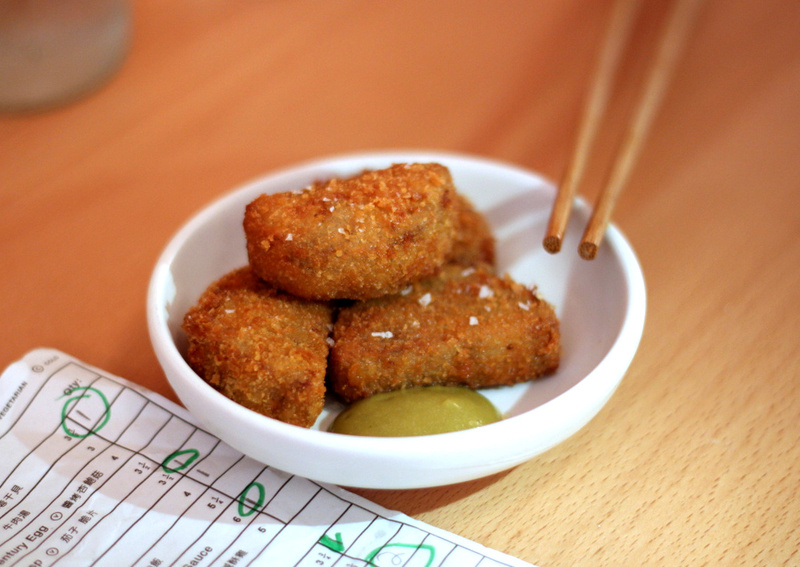 The Classic (Braised Pork, Peanut Powder, Fermented Greens, Coriander) is already an essential Soho snack at £3.75. 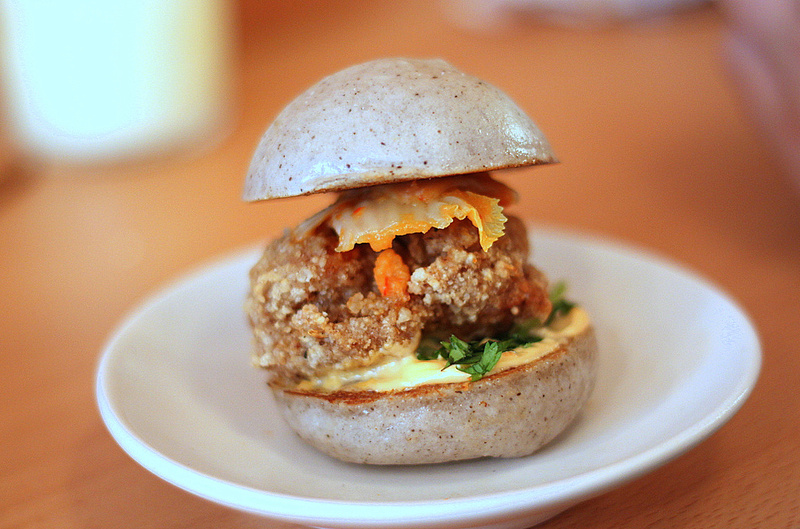 Be sure also to get the stunning Fried Chicken Bao, presented in burger form in a soft Sesame Bao, with Soy Milk Marinated Chicken, Sichuan Mayo and Golden Kimchi. Confit Pork, Lamb Bao and veggie Crumbed Daikon Bao are ready on the subs bench. Don't leave without ordering the Fried Horlicks Ice Cream Bao (Horlicks Ice Cream, Condensed Milk, Fried Bao) for £4, and eat it AS SOON AS IT ARRIVES. By the time I'd done my offensive blogger photography, we had a sticky, gooey mess on our hands. Delicious but disastrous. 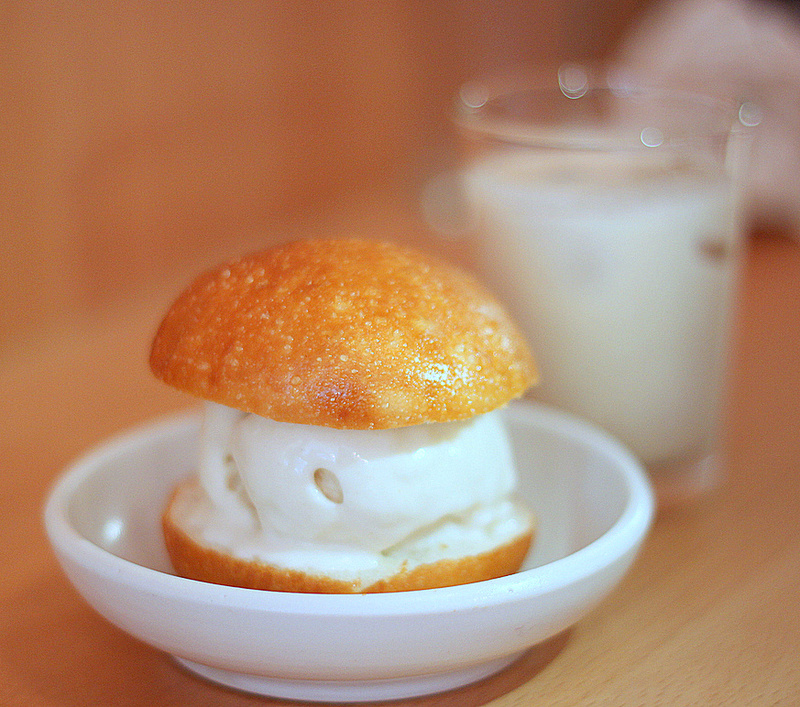 Fried Horlicks Ice Cream Bao - devour before it melts! So the food is incredible. What about the drinks? I went for some BaoZhong Foam Tea which I didn't agree with at all. I would instead opt for the 10 year Aged Coal Baked Oolong which sounds magnificent. Elsewhere, three types of Sake, Cider and Beer should be enough to see you through since Bao dining is a speedy affair. 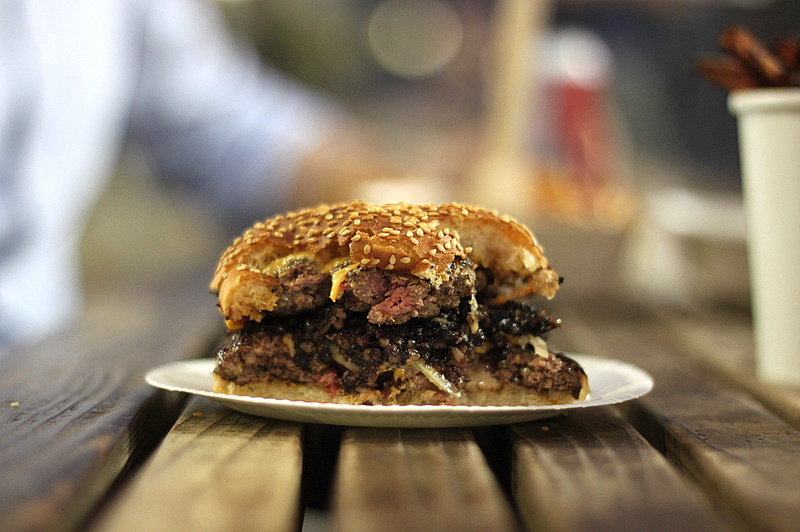 Tuesday April 7th - Bleecker Burger, street food veterans and winners of London Burger Bash 2014, recently opened a burger hatch in Old Spitalfields Market. I say hatch rather than restaurant or diner, as it is literally a hole-in-the-wall kitchen with a few benches outside. Is it any different to them parking their food truck behind a brick wall with a window? Not really, but who cares? 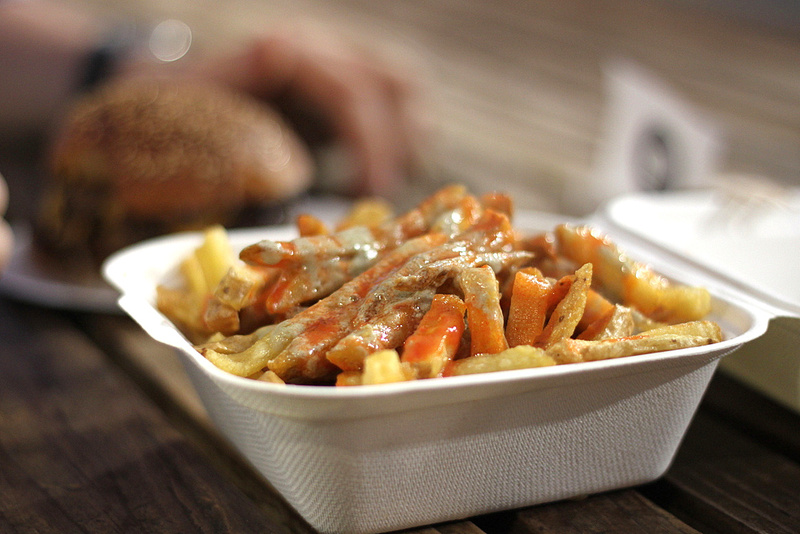 Now we know where to go for a fix of angry fries and Bleecker meat every day of the week (from 11.30am-9pm). The slightly bigger space allows them to produce some rather fine milkshakes (including Caravan coffee) which you might turn to after they stop serving craft beers at 7pm. 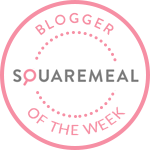 But you are really here for a burger; an award-winning Bleeckerblack burger to be precise. Two medium-rare aged-beef patties, melted cheese, and a showstopping slab of black pudding, at your service. Sure, you could get a Bacon Cheeseburger, or the Blue Burger, both superb, but I wouldn't. What a burger. What else? I can never say no to Sweet Potato Fries, but the Angry Fries with blue cheese and more than a bit of a kick put up quite a fight. And that's all I need to say about that. Just be wary of the 9pm closing time (which could change of course - check here). After all that food, you might fancy a drink somewhere nearby. You've got Discount Suit Company, 46 & Mercy, Brewdog, Underdog, Ten Belles and many more worthwhile establishments within easy reach. We decided to go slightly further afield to The White Hart in Whitechapel which recently had a refurb and has re-established itself as a brewpub with One Mile End Brewery in their basement. Brewpub beer can often be rather bland and unadventurous, but that is not the case here. 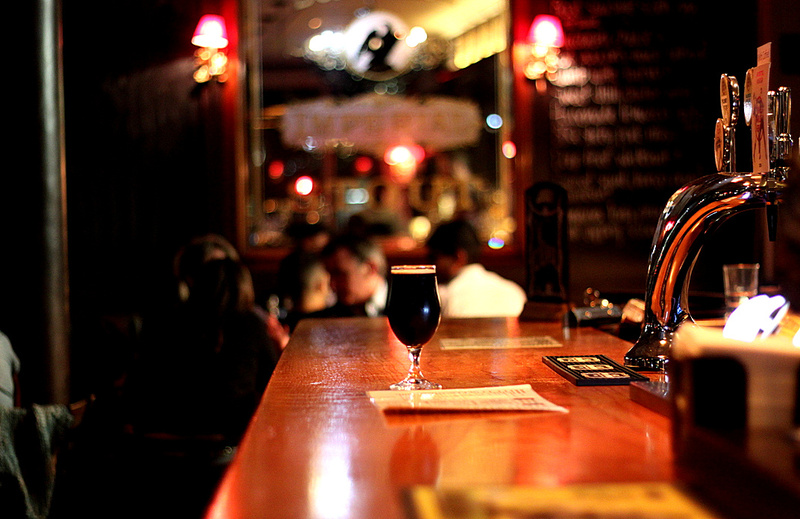 One Mile End mean business, as a recent tap takeover of Brewdog Camden proves. Alongside exemplary core beers such as Salvation Pale Ale, Snake Charmer IPA and Hospital Porter, you'll also find the likes of Rye Whisky Sour, Blood Orange Barrel Aged Saison, Farmhouse Pilsner and a Pale Ale infused with Pomelo and Chilli. The winner for me though was a dark and dangerous 7% Barrel Aged Black Sour (pictured below). You will be able to find One Mile End beers in boozers all over London, but it's well worth a wee pilgrimage to their lively public house in Whitechapel. With the District Line and the Overground a stone's throw away, it's actually pretty convenient. Plus they've got Dirty Burger and Chicken Shop as neighbours.